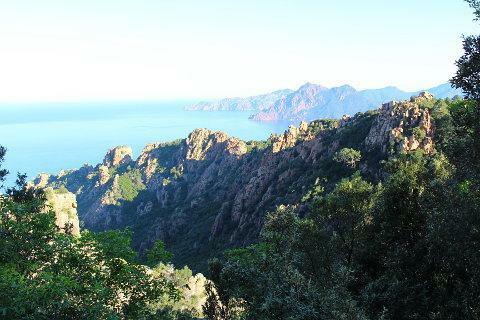 Some of the dramatic rocks plunge towards the sea below, others stand poised high above at altitudes up to 300 metres, all are fascinating and beautiful, with the sea providing a perfect backdrop. 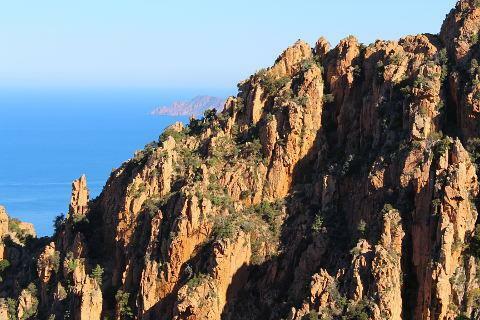 Being situated to the west of Corsica, the rock formations are at their most red - and most beautiful - at sunset. 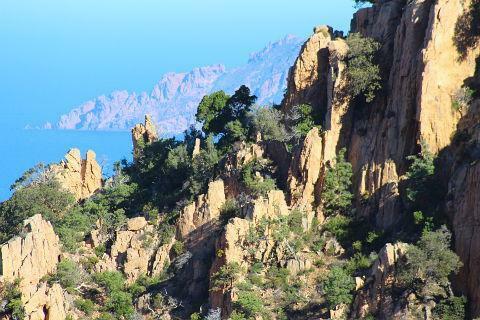 The drive through the Calanches de Piana follows the D81 south-east from Porto. 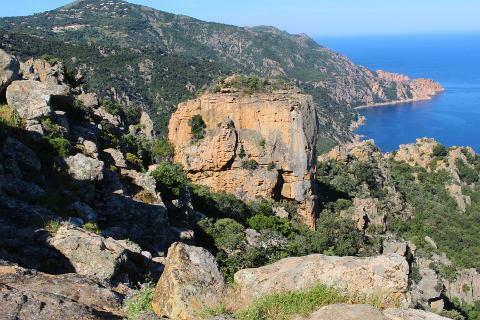 It is one of the great drives of Europe and not to be missed if you are visiting this region of Corsica! 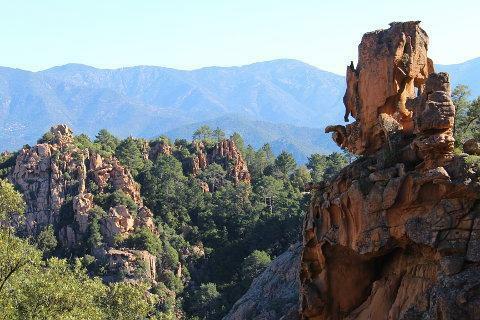 There are various places where you can stop to admire the views and the rock formations. Some of the rocks form interesting shapes such as this heart shaped hole in the rocks. Because they are so attractive, and are now a UNESCO World heritage Site, the Calanches are also very popular and the road can become very busy during the summer months. However the road is fairly wide and there are a good number of passing places. There is a bar along the route with a terrace looking out over the breathtaking views. Hard to find a more perfect spot for a coffee or a beer! 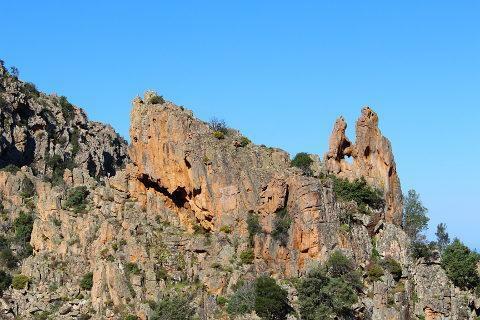 Much the best way to enjoy the Calanches is to leave your car and take one of the short walks that wind through the granite, a new spectacle or rock formation unfolding at each turn. 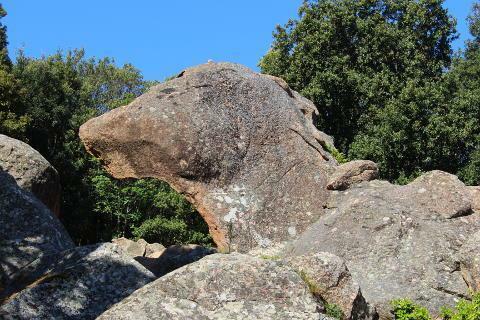 There are various different walks and we chose one of about one hour there and back starting at a very distinctive rock called the 'tete du chien' or 'head of a dog' (see photo in gallery below). 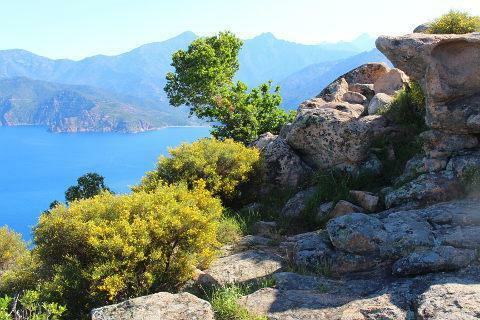 This walk is best done in sturdy shoes as it has some slippery rocks and some steep sections but is not difficult or too strenuous (or vertiginous). 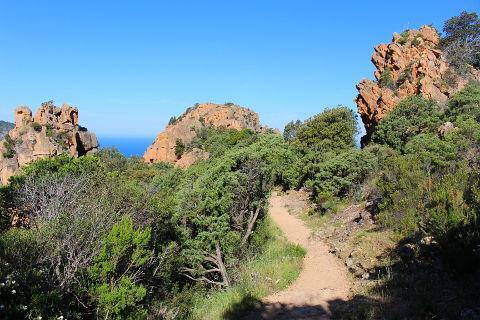 It was fabulous to be outside walking through the fabulous rocky scenery and enjoying the magnificent views at a leisurely place. The walk ends in a rocky plateau overlooking a large square rock known as the 'chateau fort' or 'fortified castle'. We can't wait for our next visit in order to explore some more of the walks. An alternative, or even better a second, way to see the calanques is by boat trip along the coast from Porto. Your boat trip will also enable you to see the coastal caves of Capo Rosso (trans: Red Cape). The trip costs around 25 euros. For about 42 euros per person you can take a 2 hour boat trip around the Scandola Nature Reserve and to the hidden village of Girolata. A three and a half hour boat trip combining the above costs about 55 euros. Whilst not cheap all 3 trips provide an unforgettable experience. The village of Piana is quite small but also very worth exploring. The main historical monument in the village is an 18th century baroque style church that contains some interesting frescoes.